For the majority of the UK, the August bank holiday weekend will revolve around BBQ’s, a nice tipple, (hopefully) enjoying some sunshine and a good spot of rest and relaxation - probably in front of Netflix. But what if you think outside the box this year? 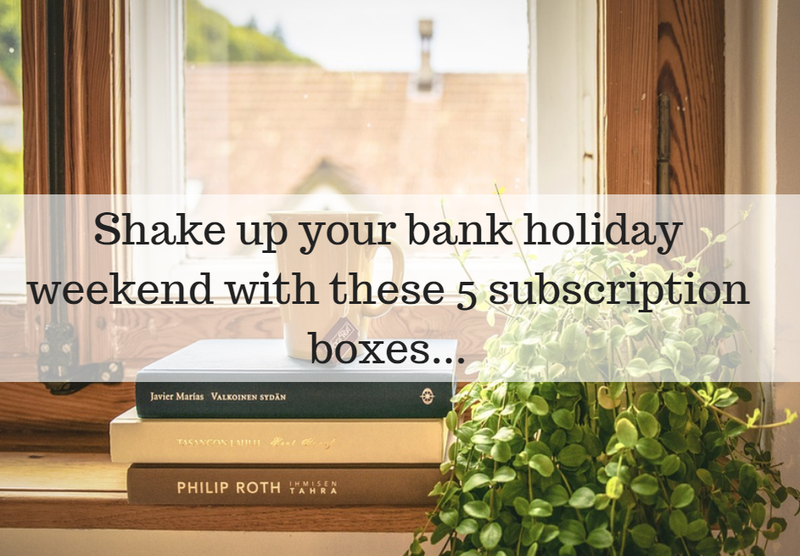 Push the boat out, shake it up a bit and dive into these 5 subscription boxes to give you an alternative bank holiday weekend. Why not skip the Netflix and chill this bank holiday weekend and embrace your inner child instead? Craftiosity is the ultimate modern craft kit for adults which delivers tools, materials and step-by-step photo instructions to help you create beautiful items in your own home. Enjoy therapeutic delights such as candle-making or lino cut printing and give yourself a creative memento of a well-spent bank holiday weekend. Better yet, ask your friends over and spend the day crafting something together! If you’re anything like us here at uOpen, then the mention of ‘bank holiday weekend’ screams BBQ, and it screams it loud and clear. Now, far be it from us to knock the humble BBQ but if you fancy a delicious shake up this year, then we recommend giving the Storimarket Ethical Snack Box a go. No need to travel far and wide, this delicious monthly box will deliver 600g of snacks that have been ethically sourced from socially responsible producers and farmers in Kenya, Tanzania and Uganda. You can expect tasty chocolate-coated treats, delectable dried fruit and much more. It might even be a welcome break from one long hot summer of BBQing. Take a break from the standard glossies and treat yourself to an alternative, original and exciting new magazine every month from Stack Independent magazines Box. Step outside of the ordinary and lose yourself in the pages of fascinating publications that will inform and entertain you. Why not use the bank holiday weekend to learn something new? Stack’s magazine selection swerves the mainstream to bring you inspiring and intelligent content that makes for great conversation starters and will teach you exciting new things about the world around you. If you’re fed up of the magazine stand at your local newsagents, this subscription box is for you. Sure, we all love the mars bars, milky ways and galaxy caramels of this world; but this weekend is for breaking the ordinary, so switch up your sugar fix too with the Taffy Mail Box. Providing you with a delicious mix of both classic American favourites and more obscure treats, get ready to sink your teeth into something tasty and extraordinary. Enjoy Twinkies and Hershey’s alongside dessert flavoured chewing gum or cookies ‘n’ cream dipped pretzels and wash it all down with a delicious, authentic American soda. Celebrate your sweet tooth the exciting way, no more tired twixes for you! If you’re a face mask enthusiast, enjoy a good bath bomb or love testing a new body butter - you’ll know how important it is to look after your skin, but will also know it can be hard to find natural products free from chemicals and preservatives. Step in; The Good Butter Company. Each monthly box contains a selection of raw, organic and fairly-sourced ingredients ready for you to create your own unique and alternative cosmetics. Skip the high-street sheet mask this weekend and have a go at creating something beautiful yourself at home. Congrats, you can now tick ‘self-love’ and 'recharging' off your to-do list for the weekend. Whatever your plans are this bank holiday weekend, break the mould and try something new with an alternative subscription box from uOpen. You can find all of the above boxes and many more fantastic subscriptions at uOpen.com. Food, Arts and Crafts, Health and Living, you name it - we’ve got it.